Designed by Captain Bethel Abiel Revelli and manufactured by Fiat the Modello 1914 unlike most of its contemporaries used a blowback action rather than a gas operated system. It was chambered in Italy’s standard 6.5x52mm service cartridge the Modello 1914 fed from an unusual magazine which held cartridges in rows of five with each magazine holding 50-rounds. The weapon also had two modes of fire, slow and fast, which varied its cyclic rate. Unlike contemporary water-cooled medium machine guns the Fiat-Revelli used a water circulation system which pumped condensed water back into the jacket. The assistant gunner worked the pump, the two hose connection points can be seen beneath the barrel jacket, near the trunnion. 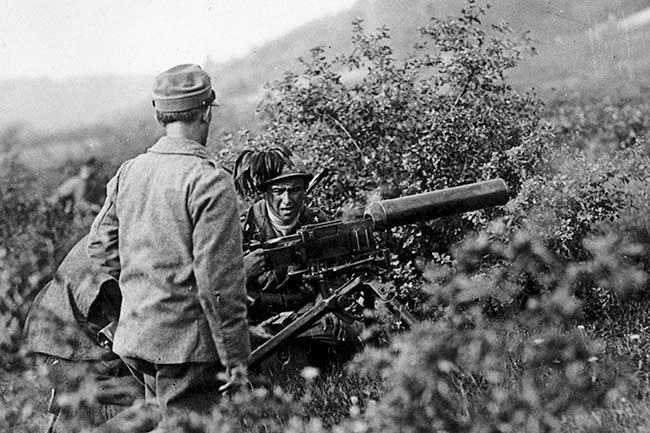 In the photograph above an Italian machine gun crew fires from the cover of vegetation. The Modello 1914′s water can and dual jacket hoses cannot be seen but the gun appears to be in action. 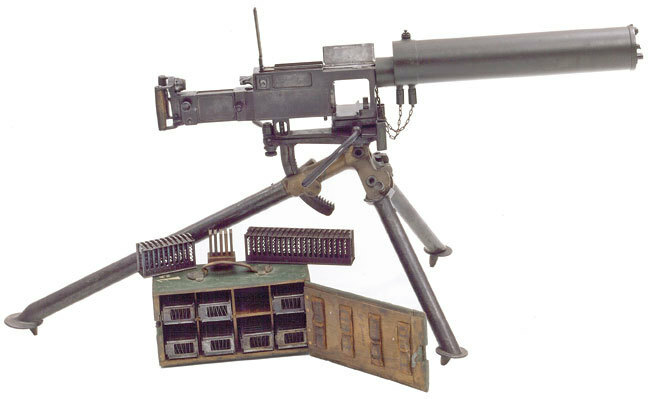 The Revelli Machine Gun was extensively tested by the Italian military, as was the competing Perino Machine Gun, during the early 1900s. With the outbreak of World War One Italy’s sources for imported foreign machine guns dried up. The Italian military decided that they needed an indigenous design. Fiat-Revelli was deemed to have performed the best with Fiat also having the necessary production capacity. Italy entered the war on the Entente side in September 1915 and the Modello 1914 saw action throughout the war and continued in service into the 1940s albeit in a modernised belt-fed, air-cooled Modello 1914/35 form. This work is a study done by Italian war artist Giulio Aristide Sartorio for his series about the Carso front. It shows us the transport of a gigantic mortar by Italian troops in the region of Monte Vodice.